I almost made it through the post turkey day shopping chaos without buying anything just because it's on sale. Almost! It was a pair of cute leather congnac booties, with an additional $25 off their already reduced price that I could not resist. The Jessii boot by Steve Madden was originally $130, and I got them for under $80. Fifty dollars is a very persuasive reduction, and of course I wish they were less, but it has become tremendously difficult to find leather boots - that I really like - for $50 or less. Even at TJMaxx, I'll pick up a cute boot, look at its $50 price tag, then read its "All Manmade Materials" stamp inside! If my desire for a leather boot means occasionally paying a little more, I think it's worth it. The boots also mark the twelfth pair of shoes I've purchased this year, so if I'm going to be true to my New Years Resolution, I can not buy another pair until January. It's only one more month. I can do it. Did you make it through the biggest shopping weekend of the year without damaging your bank account, or did you find some sales just too good to pass up? OH, those are pretty. 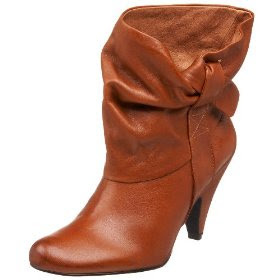 I actually find it really tough to nab a pair of brown boots that I LOVE. not lust, not feel some butterflies towards, but LOVE. I think you just found me a winner! Good purchase!